Opening: Carlo Motta, Ed. 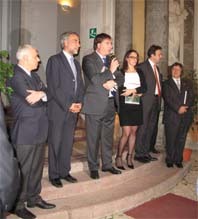 G. Mondadori; Patrizio Lodato, Assessore ai Beni Culturali; Giovanni Avanti, Presidente della Provincia Regionale; Daniela Brignone, Curatrice; Eusebio Dalì, Assessore alla Cultura e Carlos Julio Sassu Suarez, Archivio Aligi Sassu. Carlo Motta, Daniela Brignone, Natalia Sassu Suarez Ferri, Carlos Julio Sassu Suarez e Giovanni Avanti. With this important exhibition of paintings, in the extraordinary scenery of Palazzo Sant'Elia of Palermo, we conclude the events organised this year by Archivio Aligi Sassu to keep the memory of our maestro alive and to pay homage to him in the tenth year after his passing. After the anthologic displays on the unpublished drawings, that took place in Milan, Besana Brianza and Arezzo, and the one on sculpture at Ome in Franciacorta, we complete in Sicily this travel around Sassu's art through the artistic expression for which he is mainly known, painting. The eighty paintings on display and in this catalogue, several of which unpublished, come from private collections and from our archive and they cover a pictorial path that goes from 1929 to 1997, enabling an comprehensive and deep approach to the expressive painting by Sassu. In the rooms of the Palazzo it will be possible to see, for the first time in Sicily, Uomini Rossi, Cyclists, Horses, Caffè, Landscapes, Mythology and other themes that represent the most significant phases of Sassu's painting. It is a rich anthological exhibition that starts off with a primitive work of 1929 and ends with a Caffè of 1997, both essential stages in Sassu's activity, in terms of style and subjects. Copyright © 2010, Archivio Aligi Sassu®. Tutti i diritti sono riservati.